The KOA Campground turned out to be excellent and had the cleanest and best equipped laundry yet. It also had a guy who rents a space and steams fresh caught live lobster and corn on the cob for about $20 each. We went for it and had an excellent dinner. This morning we were second behind a tour bus on the high speed catamaran ferry to Yarmouth, Nova Scotia. The ferry cruises at 55 mph and is powered by four 6,500 horsepower jet pumps. That's 26,000 HP in total. It was built of aluminum in Australia. 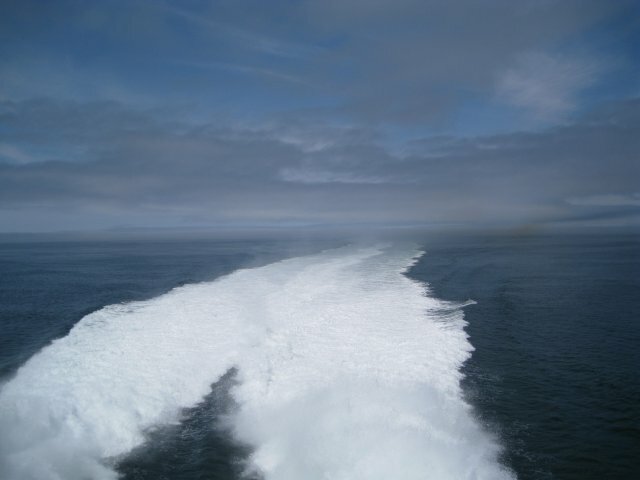 The jets are 22 feet high and the wake was so long it disappeared into the fog ½ mile behind us. (see photo). From Yarmouth we drove across the southern part of Nova Scotia to Port Medway. This is a very small town. Once a boat building and fishing town with a population of 3,000 it is now a retirement and fishing town with 200 people. We visited with Nortel friends, Jane and Colin. We had a four course gourmet dinner prepared by Colin and drank too much wine. The View was parked near the house and had a magnificent view of the long Port Medway bay.